Has the Holiday rush been keeping you busy all week? Well, that means you might have missed some of the interesting stories and cool articles that we have been posting over the past days. But fear not, for here is a list of the ones that stood out from the rest. The week started with a spicy rumor involving HTC and AT&T. It is said that the Taiwanese manufacturer is working on a high-end, LTE-capable Windows Phone device, which is to materialize on the carrier’s shelves in early 2012. At the same time, the HTC Elite is rumored to be the company’s flagship Android smartphone for the first half of next year, and Ice Cream Sandwich is to be its flavor. Once again, AT&T is said to be the carrier interested in offering that mysterious beast of a smartphone. But that is not all! Just recently, we heard of yet another top shelf Android smartphone, which is also believed to be bound for AT&T. Known only as the Sony Ericsson LT28at, the device is said to boast a dual-core 1.5GHz processor, a 4.55-inch 720p display, and a 13-megapixel main camera. Speaking of AT&T, the carrier announced earlier this week that it is giving up on its acquisition of T-Mobile from its parent company Deutsche Telekom. Instead, AT&T will pay the breakup fee and look into striking a roaming agreement with the carrier. HTC prepping a 4G LTE Windows Phone and a flagship Android 4.0 ICS device for AT&T? So far, only three devices have been given the privilege to carry the Nexus brand – the Nexus One, Nexus S, and the Galaxy Nexus. But a tablet is expected to join the party within the next six months, and Google’s very own Eric Schmidt was the one who spilled the beans on that. Unfortunately, pretty much nothing is known about the actual device at this time, yet the closer Google I/O is getting, the more we are going to hear about it. The week brought both good and bad news for Apple. First, the company scored a small victory in the ongoing patent battle against HTC, and for a moment, the chance of the Taiwanese manufacturer having some of its products banned from being sold within the U.S. was present indeed. However, HTC was quick to announce that it is working on a non-patent infringing solution, so not a single one of its smartphones or tablets is in danger. At the same time, no patent victory for Apple is expected on the German front. For those of you not familiar with the matter, Apple is trying to ban the Samsung Galaxy Tab 10.1N in the country. By the way, we decided to test a trio of 4G LTE devices for Verizon – the Samsung Galaxy Nexus, the Motorola DROID RAZR, and the HTC Rezound, and see which one of them can deliver the fastest LTE speeds. Check out our comparison for the full results. Our interview with HTC on the partnership with Beats by Dr Dre is another post that is totally worth your attention. We also took a closer look at Apple’s iAd platform, which is why we now know the reasons why it is not very popular among advertisers. Last but not least, we have compiled a list of ten great Android applications that pretty much every student will find extremely useful. That Intel is planning on entering the smartphone and tablet arena with chips of its own is something that we have heard of plenty of times before. However, what such a device would look like was more or less a mystery until recently. Just a few days ago, an image depicting an Android smartphone with an Atom Medfield chip surfaced on the web. Still, bear in mind that the said device is just a prototype unit that is not likely to ever hit the market, or at least not looking exactly like that. 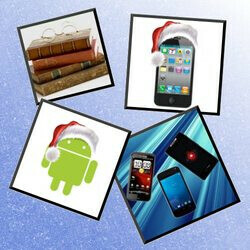 And here is a good selection of applications to get you in the Christmas mood. Be it an iPhone or an Android smartphone that you are holding on to, there will definitely be something that will make your holidays more enjoyable. Happy holidays, everyone!